The 2008 financial tsunami spread across Asia, affecting China, Hong Kong and Macau. After it occurred, similar to other organizations servicing the homeless, Christian Concern for the Homeless Association (“Association”) received numerous telephone enquiries. Quite a number of them were about hostel applications and such enquiries kept increasing. The enquiries were made from the locals as well as Hong Kongers living in China who did not know where to turn to. The problem was that they had been away from Hong Kong for too long, and they were not qualified for social security assistance. One of the former factory owners shared that close to 50,000 factories closed down and a lot of Hong Kongers were affected. This was mainly due to the tightening of product quality assurance policy in Mainland China, environmental protection policy and implementation of the new labor law. Products made in China were often criticized for their poor quality, leading to the necessity for the Chinese Government to tighten the quality assurance of its exports. In addition, the Chinese Government forced factories to move to remote areas in the name of quality assurance policy, causing factories to close down if they were unable to do so. The new labor law overly protects employees, and many factories closed down due to the new law. Besides, casino business and construction projects in Macau were negatively impacted because of the restrictions imposed by the Chinese Government on the number of visits Mainland Chinese made to Macau. It was reported in newspapers that about 10,000 people became unemployed; and as a result, Hong Kongers working in Macau came back to Hong Kong to look for jobs. The unemployment rate in Hong Kong would definitely go up; and a lot more people might become homeless due to poor financial situations; and some of them even chose to stay in 24-hour McDonald’s restaurants – going out to look for work during the day and coming back to sleep at night. The Association was unable to meet such huge demand given the number of available beds. Sometimes we rejected applications because of full occupancy at our hostel; and felt sad listening to their helpless responses. Over 20 years’ experience of servicing the homeless shows that people’s motivation to make a change will be greater if early intervention is made before or at the initial stage of becoming homeless. On the contrary, people who have been homeless for a substantial period will have little motivation to make a change and some of them will even choose to give up. At that time, the majority of people in need and about to become homeless had the ability to work. We really hoped that we could have a bigger hostel available, to be able to meet the increasing needs of the homeless, to give blessings and provide assistance to help them overcome adversity. 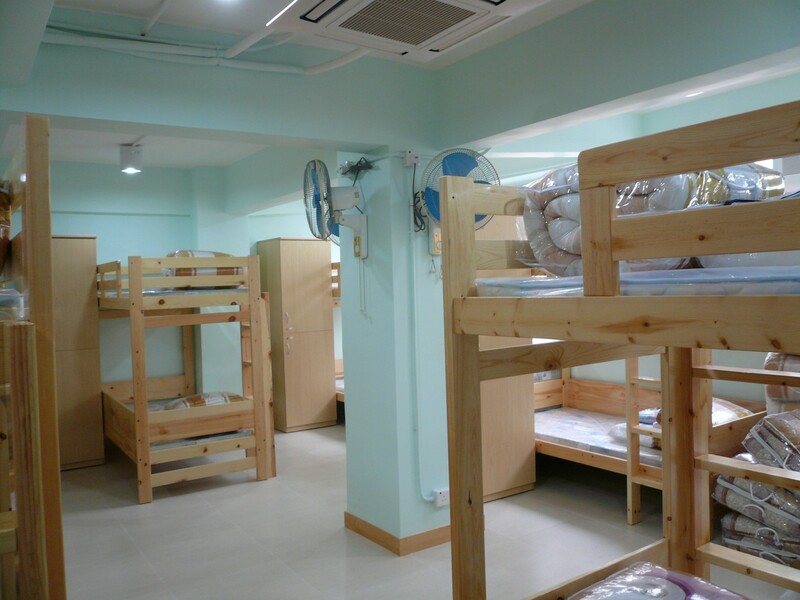 Our commitment to and love for the homeless had touched a businessman who bought the entire floor of a building on Nam Cheong Street for the Association as our new office and centre, so that the original office and centre on Wong Chuk Street could be converted to a hostel and increase the number of beds. Although we had a new place, another headache was how to raise funds for fitting-out, furniture and daily necessities. The Association is just a small voluntary organization with little cash on hand. We could only have faith in God in supplying what we needed. What amazed us was that, when we got the permission to convert the old office to a hostel, the Association received a Newsletter from Fu Tak Iam Foundation about application for funding, which could be used for renovation and the purchase of goods. That was how we started contacting Fu Tak Iam Foundation and submitted our application. We are grateful to Fu Tak Iam Foundation for their support and funding for this project, making it possible for our hostel to successfully increase 40 beds and to house and provide counseling service to a total of 75 to 80 men. Apart from giving us funding, the Trustees and staff even paid visits to us to understand our needs. In the entire process, from application to approval, we received a lot of support and assistance from the Foundation. We clearly remember how excited our service-users were when they first moved into the hostel in 2010. The hostel does not look grand, but it is clean and comfortable and has what it needs. The hostel has two main areas: one area is for those with the ability to work; and the other area is mainly for the elderly or people with special needs. They work together and do the cleaning. Some of them even offer to look after the elderly fellows, or to go with our workers to conduct outbound visits and care for those who have similar sufferings. They share and support each other; and our workers provide the necessary assistance, such as counseling, job-seeking etc. Most of our service-users become homeless or at risk of being homeless because of various reasons such as gambling, drug addiction, alcoholic addiction, old age, family problem, chronic illness, personality disorder, mental health problem and finance management problem…etc. Based on their needs, our workers will provide counseling to release their emotional stress; through Christian belief and care, to rebuild their positive values. Moreover, we set up plans with them such as financial management and employment training, helping them to reintegrate into the society and become self-reliant. If possible, we will also contact their families and see if we can help them rebuild their family relationships. As what the slogan of our Association says : “To rebuild the fractured images. To reconcile the broken families. To rekindle the feeble hopes”. In addition, we hold gatherings for the service-users who are living or lived in our hostel. For the newcomers, they can get support from those who had gone through the same crisis. For the ex-service-users, their relationships with us have never stopped even after they have moved out. Some of them shared that they had never expected to have such a wonderful place to stay when in hardship, to re-organize themselves and start anew. Wong Tai Ming (aliased) said that the hostel is very good and the facilities are sufficient for use. He was happy that they were getting along with each other very well. The staff of the hostel always take care of the users. “I don't worry where to stay anymore and have become much less moody. So I can review all sorts of things that happened in the past and prepare myself for the future.” Ah Lik (aliased) finds the hostel very comfortable too. The users of the hostel have become friends to support each other. “Now I can start finding a new job.” "The hostel is convenient and easy to access. When I come back from the Mainland, I am worry about a place to live. I don’t know what to do. It is lucky for me to find help here.” Chan Tai Hei (aliased) expressed his gratitude.